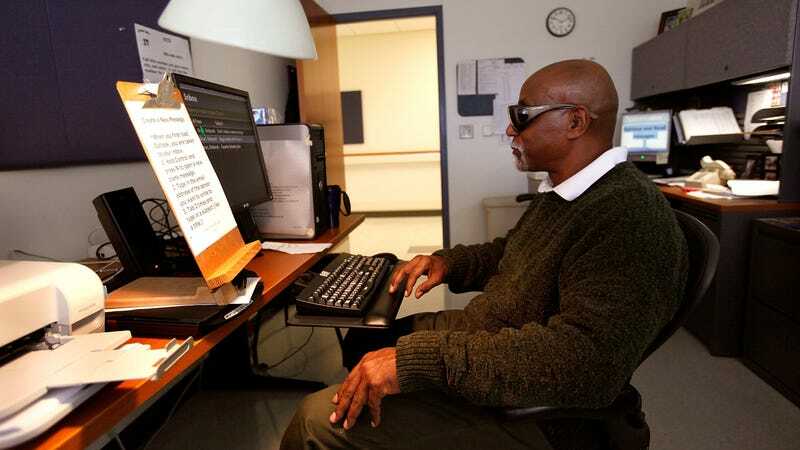 A blind veteran learns computer skills at the Edward Hines Jr. VA Hospital in Hines, Illinois. Today, many people who are blind or have low vision must cobble together different hardware and software just to use computers. But a new standard backed by some of the biggest names in tech should mean that braille device users wont have to search for custom software for different operating systems and screen readers. The USB Implementers Forum (USB-IF) announced today that it has worked with technology leaders—including Microsoft, Apple, and Google—to create a new Human Interface Device standard for braille display. The standard is intended to make it easier for different operating systems and devices to include braille features. USB-IF is a non profit formed in 1995 by several companies that developed the USB industry standard. The organization promotes adoption and implementation of USB technology and protocols. Microsoft said in its announcement that it believes developers will start adopting the new standard next year. Why Miss Your High School Graduation When You Can Dress Up a Robot in a Cap and Gown?